Engineering faculty and students at University of Rhode Island in Kingston developed a hand-held blood testing technology that combines a lab-on-a-chip device with a smartphone app. 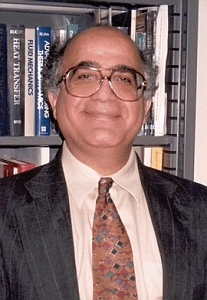 The university says several patents for been filed for the system invented by mechanical engineering professor Mohammad Faghri (pictured right) and colleagues. The device captures a drop of blood from a finger-prick on a disposable plastic polymer cartridge, which is inserted in a hand-held biosensor. The blood goes through the microfluidics cartridge in channels some 500 microns wide — 1 micron is 1 millionth of a meter — to a detector that reacts with reagents built into the device. Those reagents make it possible to detect certain biomarkers of disease in the blood sample. The biosensor then transmits the data wirelessly to a smartphone with the companion app. The interchangeable cartridges can be configured to test for specific diseases. The first cartridges test for C-reactive proteins that are produced in the liver, which for some people can help assess the risk of cardiovascular and peripheral vascular diseases. Other cartridges can be created that detect the beta amyloid protein often used as a predictor of Alzheimer’s disease, as well as viruses such as HIV, hepatitis B, and H1N1 influenza. The latest version of the device can also conduct the test on whole blood rather than blood plasma. The microfluidics cartridge filters out the blood’s cellular components and some non-target proteins that can interfere with detection of the targeted protein. The new hand-held version of the technology refines the system’s earlier, larger, and more expensive versions. The fluorescence sensor in the hand-held unit costs less than $10 compared to the $3,200 sensor in last year’s shoe-box-sized system that performs comparable functions.